Architect Sir Edwin Lutyens was at the height of his powers and popularity when, in 1911, he received a dream commission from rich London banker Henry Farrer, one of three bachelor sons of the eminent lawyer, Sir William Farrer, to build him a town house in London and a coastal retreat in the historic Cinque Port of Sandwich, Kent, where he and his brothers could escape the pressures of their busy professional lives. The London townhouse was elegant, 7, St James’ Square, and the weekend retreat was The Salutation, completed in 1912. One of Lutyens’s most beguiling creations, it is an absolute gem of a Queen Anne-style small manor house set in three acres of secret gardens enclosed by part of the medieval town walls. In this case, the gardens, although planted with inspiration from the architect’s long-term associate Gertrude Jekyll, were executed by Lutyens himself. Now, after 20 years of neglect followed by a meticulous nine-year renovation programme, both house and gardens have been restored to more than their original splendour, and The Salutation-the first 20th-century house to be listed Grade I, in May 1950-is being launched by Knight Frank (01892 515035) in this week’s Country Life, at a guide price of £4.5 million. Described in the magazine (September 13, 1962) as ‘a dazzlingly suave yet restrained reinterpretation of the old Georgian idiom’, The Salutation is no mere Georgian pastiche, but the realisation of an ingenious and complex plan. 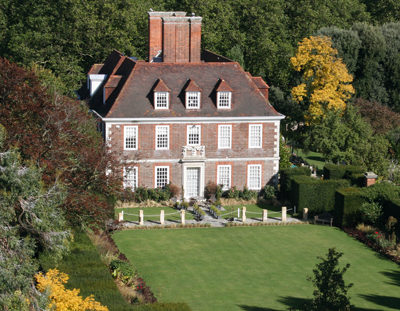 The main house, with typical Queen Anne quoins, cornices and elaborate doorways, is linked to a lower service wing built in more traditional Kentish style, giving the impression of an early-Georgian remodelling of a much older building. In fact, Knightrider House, one of three secondary houses in the grounds converted to guest accommodation by the current owners, is thought to date from the Queen Anne era, which may have had a bearing on Lutyens’s original concept. The cultured lifestyle of The Salutation’s original owners is reflected in the design and layout of the interior, where a series of lobbies leads from the formal entrance hall to the striking main staircase, which rises to a first-floor reading area-an extension of the much-frequented panelled library on the ground floor. Classic Georgian simplicity is also the keynote of the other main reception rooms, notably the drawing room and the oval-shaped dining room with its curved walls reminiscent of the style of Sir John Soane. Reflecting The Salutation’s current role as an exclusive small private hotel, there are three sumptuous bedrooms on the first floor, and a further five large bedrooms, a dressing room and a family bathroom on the second floor. The only major innovation is the light-filled kitchen/breakfast room with its adjoining sitting room and playroom, making for easy family living, as well as formal entertaining. The accommodation includes staff quarters and a self-contained office suite. It’s all a far cry from the scene of desolation that greeted owners Dominic and Stephanie Parker when, in 2004, they were looking to buy a six bedroom farmhouse in this corner of Dominic’s native east Kent, and saw an advertisement for The Salutation in Country Life. Time had not been kind to the house, which, Stephanie recalls, was ‘almost derelict, although the steel-framed fabric was incredibly solid. The interiors of the house and cottages had not been touched in 20 years, and the weed-infested garden was buried under 100 tons of rubble’. Henry Farrer had left the house to his brother Gaspard, and, when he died in 1948, it was bought by Leonard Byng, and later, in the 1970s, by Mr and Mrs Dixon, who ran it as the Salutation House and Garden Company. Thereafter, things went slightly haywire and, in the 1980s, the landmark property was the subject of various unsuccessful planning applications for development. It was purchased eventually by the Older family, but was more or less on its knees when the Parkers fell in love with it and, nine months later, bought it after some extremely protracted negotiations. Nine years on, every nook and cranny has been renovated, repaired and repainted-not once, but several times, all overseen by Stephanie’s experienced and eagle eye. And, thanks to the sterling efforts of head gardener Steve Edney and his team, who have planted more than 100,000 bulbs in various planting schemes, the gardens, based on the original layout of brick paths and terraces, yew hedges and lawns, avenues, topiary and specimen trees, once again form an enchanting backdrop to Lutyens’s Kentish masterpiece. When Lutyens was poring over his designs for The Salutation, imposing Little Court at Crockham, near Edenbridge-built between 1908 and 1912 for Ruthen Frederick Ruthven-Smith, Britain’s then ambassador to Switzerland-was already nearing completion. Unlike that of The Salutation, its 20th-century experience was infinitely more serene. In 1921, Little Court was sold to Lloyds underwriter George Malcolm, who, in turn, sold it to the locally based Durtnall family, said to be the UK’s oldest firm of family builders. 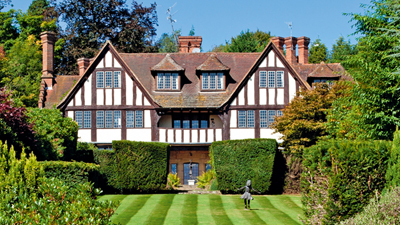 In 1974, the house was bought by its present owner, Gervais Burbidge, who, after almost 40 years in residence, is now selling Little Court with 11.4 acres of extensive formal gardens, ponds, woodland and paddocks, through Savills in Sevenoaks (01732 78970), at a guide price of £4.95m. A further 50 acres of land are available by separate negotiation. The magnificent gardens and grounds provide a wonderful setting for the house, which has more than 10,000sq ft of accommodation, including four main reception rooms, an orangery, a study, a well-equipped kitchen/breakfast room, master and two guest suites, five further bedrooms, two bathrooms and a games room. An enclosed courtyard houses a detached two-bedroom cottage with a pretty kitchen garden. Leisure facilities include indoor and outdoor swimming pools, a tennis court and stabling. ‘It’s been a long time since we have seen an influx of commuters from Battersea and Wandsworth, but, at last, they seem to be on the move’, says selling agent William Peppitt, who reckons that buyers will be hard-pressed to find another house of this stature in such a strategic location, a mere 10 minute’s drive from Sevenoaks station. Or 20 minutes at normal driving speed, the owner suggests.